Betty Crocker make great cake mix and the triple chocolate muffin mix is excellent,my muffins are perfect every time and they taste full of delicious chocolate! Betty Crocker Muffin Mix Triple Chocolate is one of the best muffin mixers around in grocery stores. I made these muffins and everyone thought they were the best and were homemade from scratch and not a packet muffin mix. Divine chocolate flavours runs through these muffins. These mixes have a great flavour. They are easy to make with easy to follow instructions. Master 9 has fun making them and teaching little brother and sister how. We love triple choc brownies in our house, the best part is that they are so simple the kids can make them (and they are still edible!) hahah seriously delicious! I recently came across this mix when looking for a last minute muffin emergency! (Friends party) Tried it and i loved the way they came out. Easy to mix and quick cooking time. Tasted great. Betty Crocker make premium products and this is one of them. Delicious! 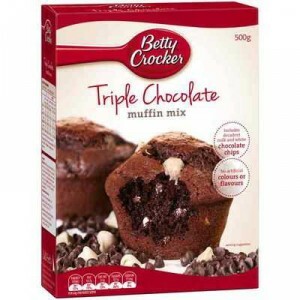 How would you rate Betty Crocker Muffin Mix Triple Chocolate?